The What: Waves Audio has integrated Waves MultiRack and Waves plugins in the KN-DSP100 Kramer Network Server from Kramer Electronics. Waves MultiRack is a software host used by FOH and monitor engineers to run multiple simultaneous instances of the same plugins used in recording studios and mixing rooms; the Kramer Network Server, with Kramer Network and DSP functionality for large-scale audio deployments, provides DSP over IP and enables simultaneous processing of 64 of its more than 1,000 input channels—and distribution to more than 1,000 outputs. The What Else: The unit is fully compatible with any Dante audio signal and provides auto-detection of all Kramer devices and their functionality. The KN-DSP100’s processing is powered by Waves and integrates with all standard IT infrastructures. Bundled with top Waves plugins—the WNS Noise Suppressor, GEQ Graphic Equalizer, Q10 Graphic Equalizer, C1 Compressor, MaxxVolume, L1 Ultramaximizer, Renaissance Compressor, X-FDBK, MaxxBass, OneKnob Louder, OneKnob Phatter and the eMo Generator—the KN-DSP100 covers a vast array of beneficial processing needs. 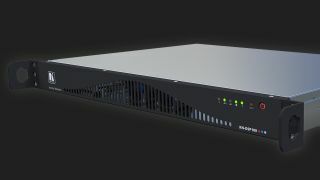 The Bottom Line: Waves MultiRack integration with the KN-DSP100 Kramer Network Server brings the same tools that live sound engineers rely upon daily to AV professionals at large-scale system deployments such as airports, hotels, courtrooms, and hospitals, providing processing of up to 64 channels over a Dante network.